Philadelphia Wedding Bands at BVTLive! The top Philadelphia wedding bands including Jellyroll, Sid Miller Dance Band, All About Me, Big Ric Rising, The Eddie Bruce Experience, Midnight Hour, City Rhythm, Strangers, Back2Life, Deja Blue, Contagious, and Vinyl Groov are at BVTLive. 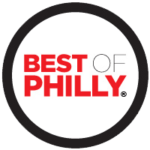 Our bands have earned the top awards in the Philadelphia area for many years including Best of Philly, Best of the Main Line, and Best of Delaware. We are proudly recommended by the top Philadelphia hotels, private clubs, country clubs, and other premier venues. Our bands consistently get great reviews on WeddingWire and TheKnot. Call us at (610) 358-9010, contact us, or sign up for our Philadelphia wedding band showcase now.